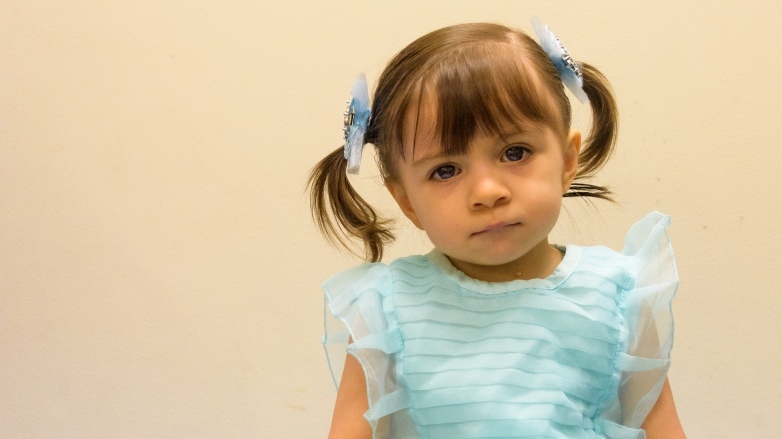 Even before Angelique Garcia was born, doctors at Children’s Hospital Los Angeles knew she had a severe form of congenital heart disease called complete atrioventricular canal defect (CAVC), thanks to a prenatal echocardiogram by CHLA cardiologist Jay Pruetz, MD. In a normal heart, there are four distinct walled chambers with valves that act as one-way doors to keep blood flowing in one direction: Right heart to lungs to left heart to body to right heart, etc. But in Angelique's heart, those walls and valves had formed abnormally, in essence leaving multiple open doors where blood from all four chambers was mixing and heading the wrong directions: back and forth between lungs and heart, and back and forth between heart and body. “The large holes in her heart were causing oxygen-rich blood from the left side of her heart to cross over to the right side, flooding the lungs with excessive blood flow,” Pruetz explains. Not only was her oxygen-rich blood diluted with oxygen-poor blood, it was moving very inefficiently, like multiple cars trying to simultaneously pass through an unprotected intersection with no traffic signs. In addition, Angelique was found to have a complicating condition: dysplastic left side valve leaflet with a severe leakage—where blood heading to her lungs was leaking backwards into her heart, further hindering blood from reaching her body effectively. As a result, Angelique's heart was overworking itself and would fail if left untreated. “Had we had her 10 years ago, she probably wouldn’t have had a chance,” says Luis Garcia, Angelique’s father. Her unusual heart condition accounts for about 5 percent of children born with congenital heart defects, but CHLA’s Heart Institute is uniquely staffed to perform the surgery that would ultimately save her life—a unique hybrid heart procedure that required the skills of both a cardiothoracic surgeon and a pediatric interventional cardiologist. 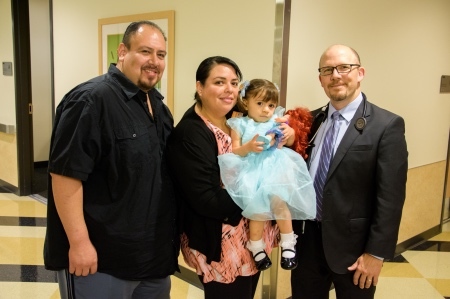 Initially, on Feb. 16, 2016, CHLA physicians attempted complete AV Canal repair on 3-month old Angelique’s failing heart, which was saddled with three separate holes, according to her dad. The complications persisted after the surgery, as Angelique continued to suffer severe mitral regurgitation, a condition so critical Angelique could not be weaned off the ventilator. Again and again, surgeons went back to the operating table to stabilize Angelique but they failed to stop the leakage, and her life hung in the balance. It was a traumatic time for the Garcia's, who stayed at Angelique’s bedside in the hospital’s cardiothoracic intensive care unit, which like most rooms at the hospital, is outfitted with a convertible bed for family members. “I appreciated having access to a chaplain and Child Life services, and Angelique enjoyed the therapy dogs to help with the stressful situation,” Maria said. Luis and Maria felt the care and surgical teams included them in every step of the process. “They would invite us to join the morning walkthroughs as the doctors would invite us to come in and listen to them and hear what they had to say, and they also took our opinions into consideration,” says Luis. It allowed the mechanical valve to grow with the child without surgery, due to the ability of the Melody valve to expand. Previously, the mechanical valves they used would need to be replaced with larger ones as children aged. This two-hour surgery on 3-month-old Angelique took place on Feb. 19, 2016, four days after the initial open heart surgery and required both a heart surgeon and an interventional cardiologist to deploy the Melody valve. After the child was placed on a heart-lung bypass machine, Richard Kim, MD, cardiothoracic surgeon, opened the child’s chest and a pediatric interventional cardiologist implanted the valve through a catheter inserted through the baby’s thigh. Once in place, the valve was open expanded using a balloon. Kim then sewed the valve to the heart canal. This unique Melody valve replacement procedure was a first for CHLA and likely for the entire western U.S.